As our customers will know, we've been true believers in Bitcoin for about as long as there has been Bitcoin in the world! We've been accepting it for several years now, and wanted to share our data on Bitcoin payments! So without any further ado, here it is! The percentage numbers on the left are for the % Transactions and % Revenue, and the dollar prices on the right side are for the Bitcoin price. Our data does not support the fear that Bitcoin use has stopped, or even slowed down. The percentage of bitcoin transactions did drop off around October 2014, because we adopted a new rule requiring first-time bitcoin payers to pre-pay for a full year. 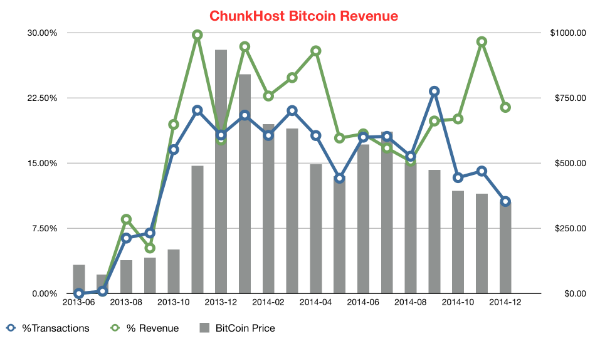 Bitcoin revenues (as a percentage of overall revenues) have remained steady throughout 2014.